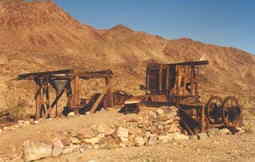 REMAINS: The mine and remnanats. 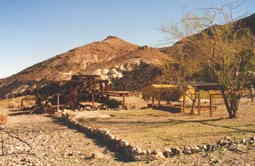 There is a plaque at the site that reads thus: WARM SPRINGS WAS USED BY THE PANAMINT SHOSHONE NATIVE AMERICANS AS A WINTER CAMP CALLED PABUNA. DURING THE 1880S PANAMINT TOM RAN A RANCH AND ORCHARD UNTIL JULY, 1887, WHEN A FLASH FLOOD WIPED OUT HIS CROPS AND 150 FRUIT TREES. 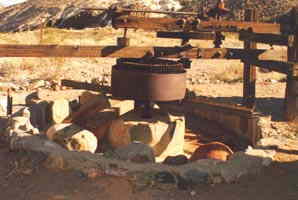 DUE TO THE AVAILABILITY OF WATER AT THE SPRINGS, A MILL WAS SET UP IN 1932 TO RECOVER GOLD FROM ORE MINED AT GOLD HILL. 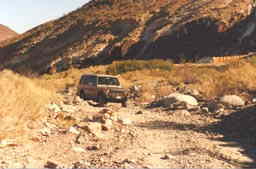 A TALC MINING CAMP OPERATED HERE FROM THE LATE 1930S UNTIL 1988. 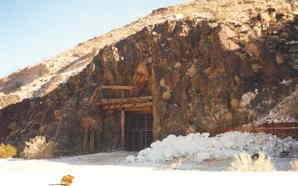 THE LAST CLAIM HOLDER, PFIZER INCORPORATION, DONATED THE SITE TO THE CONSERVATION FUND FOR EVENTUAL DONATION TO THE NATIONAL PARK SERVICE. The site contains several buildings, garage, swimming pool fed by warm spring water, mine structures, huge mine portal. When I visited in 1996 I found the place to be in fairly good shape, although one dwelling structure was in a sad shape of disrepair. The pool showed signs of recent cleaning, and cleaning supplies and a jug of Clorox sat nearby. In 1997 I found the dwelling in a worse shape. The pool was empty, incoming water diverted and running down the wash. At an elevation of about 2,500 feet, winters can be cold enough to put ice on the pool, so someone thoughtfully diverted the water and drained the pool. 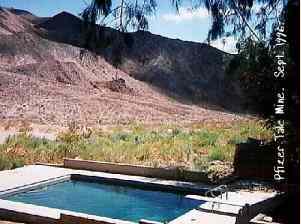 Death Valley National Park has plans to clean up the site.